spinal cord injury repair and muscle regeneration. The whole is rounded off with a look at future prospects in sustainable energy generation and storage. Invaluable reading for materials scientists, polymer chemists, electrotechnicians, chemists, biologists, and bioengineers. Technological Sciences and Engineering. Professor Wallace`s research interests include organic conductors, nanomaterials and electrochemical probe methods of analysis, and the use of these in the development of Intelligent Polymer Systems. of Wollongong. His research interests include the development of conducting biomaterials comprising of organic conducting polymers, carbon nanotubes and degradable polymers and using these to influence cellular responses in systems such as nerve and muscle as well as their use in controlled release of therapeutic drugs. Robert Kapsa (PhD-1996, The University of Melbourne) is a Molecular and Stem Cell Biologist whose research has focused on the development of genetic and cell-based therapies for Neuromuscular Disorders such as the Muscular Dystrophies and Motor Neuron Diseases. 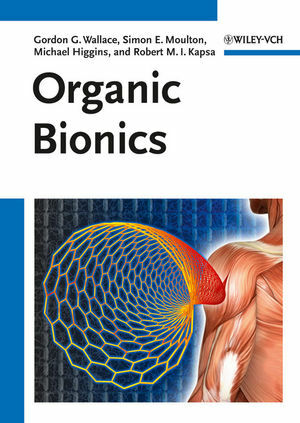 More recently, he has worked with Gordon Wallace and Graeme Clark in heading the Australian Research Council (ARC) Centre of Excellence for Electromaterials Science Bionics Platform in developing regenerative Bionics implants by which to repair damaged and diseased muscle and nerve. Currently, his research focus is on the mechanisms by which electrical stimulation and the specific molecular chemistry of materials elicits changes within the molecular biology, structure and function of nerve and muscle (excitable) cells. Michael J. Higgins completed his PhD degree in Biology and Chemistry at the University of Melbourne, Australia in 2003. He was a research fellow at the Centre for Research on Adaptive Nanodevices and Nanostructures (CRANN), Trinity College Dublin, Ireland in 2003 - 2007. Electromaterials Science (ACES), University of Wollongong, Australia. His research interest is the cellular-material interface and application of scanning probe microscopy techniques to study biological systems at the nanoscale. WHERE ARE WE? WHERE DO WE GO NOW?